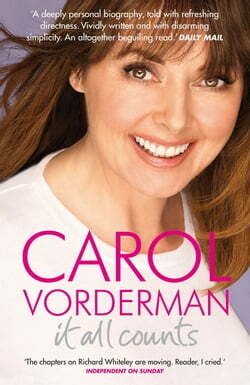 Carol Vorderman is everywoman: a single working mother, a businesswoman and a devoted daughter. And now, for the first time, she has decided to tell it like it is.Since 1982, Carol was much loved as co-presenter of Countdown with Richard Whiteley. Joining the show at the age of twenty-one after her... read more mother secretly posted off an application, she became the first woman to appear on Channel Four. Vorderman and Whiteley went on to form one of the most endearing partnerships in British TV history. His death in 2005 devastated Carol but she continued to present Countdown until July 2008, when, after twenty-six unbroken years with the show, it was announced that she was stepping down.Carol's life has been a rollercoaster. The youngest of three children, she was just three weeks old when her parents separated. Her father refused to acknowledge Carol, leaving her mother to hold down multiple jobs as the family's only provider. There was a stint in the circus; there have been two marriages; she has juggled a career with two children, whom she adores; she is a detox advocate and has hosted more shows than any other female presenter, including Tomorrow's World, Better Homes, Pride of Britain and, of course, Countdown.In IT ALL COUNTS, Carol tells the engrossing story of her life from an early age through to today - the personal struggles, the good times, the sad times, and lifts the lid on what really goes on behind the scenes in a TV studio and the full story behind her shocking Countdown departure.